IMO annually announces the Global Eco-Marketing Sites (GEMS), a list of locations around the globe that best combine nature and marketing. Sites named a "GEM" meet the three crucial criteria taken into consideration: nature preservation, regional economic vitalization, and cultural contribution. 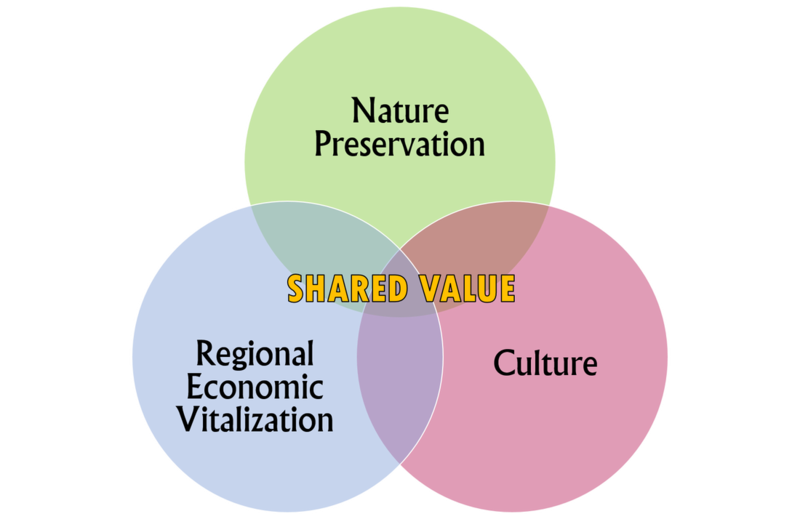 The goal is to recognize places where shared value is created through overlaps of ALL three criteria. These criteria, individually, are fairly straightforward. The idea of preserving nature is not new at all; mankind as a society have realized that humans cannot live without nature, and great effort - much of it in the last century - has been made to protect parts of nature we deem precious. Regional economic vitalization can be done by any type of activity - manufacturing, agriculture, tourism, etc - if it brings in money and jobs to the local economy. Culture, then, is the direction in which a community of any size - national, regional, local - moves, something created by collective community involvement. Nature is very significant for regional identity and it is very common for nature to define and be synonymous with the culture of certain regions. What would it mean to combine the three? GEMS must combine nature preservation, sustainable development, and community involvement, and create positive value - economic and cultural - for all parties involved and more. It must be active in sending a message across to the global audience about sustainable use and the importance and need of natural resources. It must promote respect for the environment and awareness of key issues facing society on this dynamic planet we live on. It must engage and empower the community through education and actively communicate with the rest of the world, aiming to share as much value as possible. - Each IMO member country annually nominates and registers 5 sites to be considered for GEMS. - Consumers who have visited and experienced the nominated sites evaluate the nominated sites according to the criteria prescribed by IMO. - A team of professionals will evaluate each site under great scrutiny. The sites will be subject to a more detailed and harsher standard than they were in the consumer evaluation step. - 7 sites considered to have met the criteria with the highest marks will be announced at the annual Global Marketing Conference. Sites named as GEMS may be re-nominated the following year.